By Linda Raftree on April 18, 2017 | Comments Off on Can Microwork and Impact Sourcing Improve Youth Employment? To frame the discussion, we provided some core definitions and an explanation of the premise of microwork and its role within Impact sourcing. It is believed that if microwork is done within an impact sourcing framework, it has the potential to create jobs for disadvantaged youth and disconnected, vulnerable populations and to provide them with income opportunities to support themselves and their families. Proponents of microwork believe it can equip workers with skills and experience that can enable them to enhance their employability regardless of gender, age, socio-economic status, previous levels of employment, or physical ability. Microwork is not always intentionally aimed at vulnerable populations, however. It is only when impact sourcing is adopted as the business strategy that microwork directly benefits the most disadvantaged. The microwork industry includes a variety of stakeholders, including: clients (looking to outsource work), service providers (who facilitate the outsourcing by liaising with these clients, breaking tasks down into micro tasks, employing and managing micro workers, and providing overall management and quality control), workers (individual freelancers, groups of people, direct employees, or contractors working through a service provider on assigned micro tasks), donors/investors, government, and communities. The report identifies three main models for microwork (as shown below); micro-distribution (e.g., Amazon Mechanical Turk or CrowdFlower); the direct model (e.g., Digital Divide Data or iMerit) and the indirect model (e.g., Samasource or Rural Shores). With the framework settled, we moved over to hearing from our first discussant, from Samasource, who provided the “implementer” point of view. Samasource has been operating since 2008. 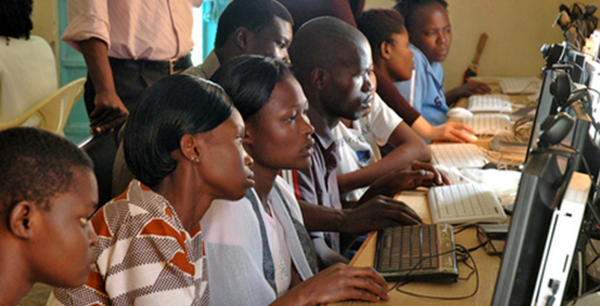 Their goal is to connect marginalized women and/or youth with dignified work through the Internet. The organization sees itself as an intermediary or a bridge and believes that work offers the best solution to the complex problem of poverty. The organization works through 3 key programs: SamaSchools, Microwork and SamaHub. At the Samaschool, potential micro workers are trained on the end-to-end process. One participant asked why the organization took 8 years to become sustainable. Samasource explained that they had been heavily subsidized by donors, and part of the journey has been to reduce subsidies and increase paid clients. A challenge is keeping costs down and competing with other service providers while still offering workers dignified work. As one of our other discussants noted, this is a point of contention with some local service providers who are less well-known to donors. Because they are not heavily subsidized, they have not been able to focus as much on the “impact” part. Both Samasource and DDD noted that workers are staying with them for longer periods of time (up to 4 years). This works well for individual employees (who then have stable work with benefits). It also works well for clients, because employees learn the work, meaning it will be of higher quality – and because the BPO industry has a lot of turnover, and if micro workers are stable it benefits the BPO. This, however, is less useful for achieving scale, because workers don’t move through the program quickly, opening up space for new recruits. For Samasource, the goal would be for workers to move on within 2 years. At DDD, workers complete university while working for DDD, so 4 years is the norm. Some stay for 6 years, which also impacts scaling potential. DDD is looking at a new option for workers to be credentialed and certified, potentially through a 6 month or 1-year program. One perspective highlighted in the Banyan report is the client perspective. Some loved microwork and impact sourcing. Others said it was challenging. Many are interested in partnering with microwork service providers like iMerit and Daiprom because it offers more data security (you can sign an NDA with service provider, whereas you can’t with individual workers who are coming in through micro-distribution and crowdsourcing). Working with a service provider also means that you have an entity that is responsible for quality control. Experiences with service providers have varied, however, and some companies had signed on to jobs that they were unprepared to train workers on and this resulted in missed deadlines and poor quality work. Clients were clear that their top priority was business – they cared first about quality, cost, and timeliness. “Impact was the cherry on top,” as one discussant noted. An aspect missing from the study and the research is that of worker experiences. (As Banyan noted, this would require additional resources for a proper in-depth study). Do workers really seek career growth? Or are they simply looking for something flexible that can help them generate some income in a pinch or supplement their incomes during hard times. In Venezuela, for example, the number of micro workers on CrowdFlower has jumped astronomically during the current political and economic crisis, demonstrating that these type of platforms may serve as supplemental income for those in the most desperate situations. What is the difference in what different workers need? One small study of micro workers in Kenya noted that when trying to work on their own through the micro-distribution model, they had major challenges: they were not able to collect electronic payments; they got shut out of the system because there were several youth using the same IP address and it was flagged as fraud; language and time zones affected the work was available to them; some companies only wanted workers from certain countries whom they trusted or felt could align culturally; and young women were wary of scams and sexual harassment if accessing work online, as this was their experience with work offline. Some participants wondered what the career path was for a micro worker. Did they go back to school? Did they move ahead to a higher level, higher paying job? Samasource and DDD have some evidence that micro workers in their programs do go on to more dignified, higher paying, more formal jobs, however much of this is due to the wraparound programming that they offer. One Salon participant raised concerns about the social services and legal protections in place for micro workers. In the absence of regulations, are these issues being swept under the carpet, she wondered. Another noted that minimum standards would be a positive development, but that this will be a long process, as currently there is not even a standard definition of impact sourcing, and it’s unclear what is meant by ‘impact’ and how it’s measured. Some wondered if microwork was just the same re-hashing of the ‘gig economy’ debate. Would it drive down prices and create extremely unstable work for the most disadvantaged populations? Were there ways that workers could organize if they were working via the micro-distribution model and didn’t even know where to find each other, and if the system was set up to make them bid against each other. It was noted that there was one platform that had been identified that aimed to support workers on Amazon Mechanical Turk, that workers there helped each other with tips on how to get contracts. However as with Uber and other gig economy players, it appeared that all the costs for learning and training were then being pawned off onto the workers themselves. Working through the direct or indirect models can help to protect individual workers in this aspect, as Samasource, for example, does offer workers contracts and benefits and has a termination policy. The organization is also in a position to negotiate contracts that may be more beneficial to workers, such as extending a 3-week contract with lots of workers over a longer period of time with fewer workers so that income is steadier. Additionally, evaluations have shown that these jobs are pulling in workers who have never had formal jobs before, and that there is an increase in income over time for Samasource workers. Our third discussant noted that the research is mixed in terms of how different kinds of microwork without any intermediary or wraparound services can actually build a career pathway. Some who are active in the space are still working hard to identify the right partnerships and build support for impact sourcing. It has been difficult to find a “best of breed” or a “gold standard” to date as the work is still evolving. “We’re interested in learning from others what partners need from donors to help scale the work that is effective.” It’s been difficult to evaluate, as she noted, because there has been quite a lot of secrecy involved, as often people do not want to share what is working for fear of losing the competitive edge. One Salon participant felt that something very bold was required, given how rapidly economies and technologies are changing. Some of the current microwork will be automated in the near future, he said. The window is closing quickly. Others disagreed, saying that the change in technology was opening up new growth in the sector and that some major players were even delaying their projections because of these rapid shifts and changes in robotics and automation.The BPO sector is fickle and moves quickly – for example voice has shifted rapidly from India to The Philippines. Samasource felt that human components were still required to supplement and train AI and DDD noted that their workers are actually training machines to take over their current jobs. It was also noted that most of the current micro workers are digital natives and a career in data entry is not highly enticing. “We need to find something that helps them feel connected to the global economy. We need to keep focused on relevant skills. The data stuff has a timestamp and it’s on its way out.” DDD is working with universities to bring in courses that are focused on some of the new and emerging skills sets that will be needed. In short, there are plenty of critical questions remaining in the area of microwork, impact sourcing and around the broader question of the future of youth employment at the global level. How to stay abreast of the rapid changes in economy, business, and technology? What skill sets are needed? A recent article in India’s Business Standard notes constant efforts at re-skilling IT workers. These question are facing not only ‘developing countries’ but the US is also in a similar crisis. Will online work with no wraparound services be a stopgap solution? Will holistic models be pushed so that young people develop additional life skills that will help them in the longer term? Will we learn how to measure and understand the ‘impact’ in ‘impact sourcing?’ Much remains to explore and test!